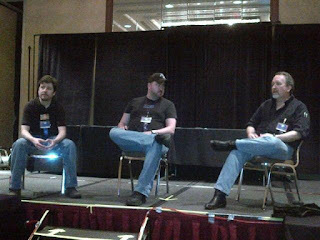 Just back in from Midsouthcon, where it was another great convention — this time with Joe Corroney, my colleague from Crimson Dynamo, and Michael Stackpole, who I edited for many years at Comics & Games Retailer magazine. There were also a whole bunch of panels with smart creative-type folks. My thanks as always to the Memphis Fanforce for all their help and to the entire convention staff! In the meantime, Michael and I both have stories in the new Armored anthology, which is out today from Baen Books. One of a series of themed anthologies from editor John Joseph Adams, the line-up for the volume also includes works from Alastair Reynolds, Dan Abnett, Jack Campbell, Jack McDevitt, Simon R. Green, Sean Williams, and Genevieve Valentine. 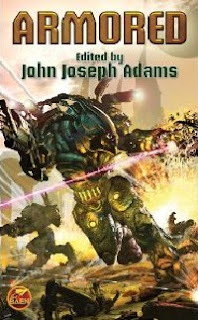 It's all on the power-armor theme — "an armor-plated clip of hard-hitting tales featuring exoskeleton adventure with fascinating takes on possible future armors ranging from the style of personal power suits seen in Starship Troopers and Halo to the servo-controlled bipedal beast-mech style encountered in Mechwarrior and Battletech." The book's official site is here, and includes some free sample stories. My own story, "Human Error," was a lot of fun to write, and is the first non-licensed fiction I've done in a long time. There'll be more to come. I'll have some notes on the story soon, but in the meantime you can check out my interview on it with Roqoo Depot, as well as my interview on the book's main site. All the authors have interviews here. You can find it at your local bookstore or at Amazon. A Bigger Slice. (Promenade 1) Discuss breaking away from licensed characters and creating your own. 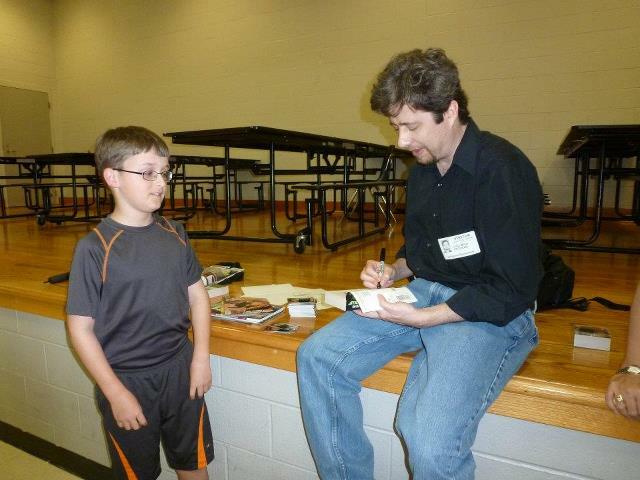 In addition to the Saturday reading and signing, I may also be found at times at the Memphis Fanforce table or in the hall with Joe Corroney. 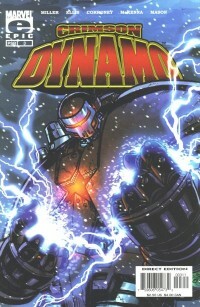 Joe's first professional comic book work, readers may recall, was my own Crimson Dynamo #3, and I will have a few of those available. Next week sees the wide release of the Armored anthology, which includes original stories by myself and fellow Midsouthcon guest Michael Stackpole, among many others. Just received my contributor copies; I'm hopeful the dealers at the con will have some. You can order the book here, and be sure to check out the Facebook page for it. Today was fun, with a visit to the fifth grades for Lakeland Elementary School; my thanks to everyone for helping to set it up! I'm leaving in a short while for Midsouthcon, my hometown convention; this year should be a fun one for Star Wars fans, as it's got Michael Stackpole and Joe Corroney among the guests. I have four or five hours of panels; I hope to get the schedule online here shortly before the show. I got my start in black-and-white small press comics, and know I'm not alone. So when I was invited to contribute a short story to the science fiction issue of The Gathering, the new talent anthology from Grayhaven Comics, I was happy to do so. T.M. 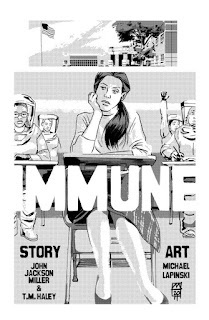 Haley, Michael Lapinski and I contributed "Immune," a silent-movie style story of a world not quite right. I like what Michael did with the story, and it was fun working with T.M., who has some more writing coming up in the future in the series, I understand. The issue is available directly from Grayhaven. You can see more work from Nashville artist Lapinski at his blog. In much faster time than for the previous episodes, I now have the production notes online for Lost Tribe of the Sith #8: Secrets. Learn what's where in the mountain Temple! As always, please read the story first. The Amazon link is here and Random House has links to other formats here, including the direct-download PDF. They're checking into the situation with the Nook download; I'm hoping it'll be online soon. That's it for the Tribe for a few months, until the release of the Collected Stories edition with the new novella in July. It can be ordered from Random House, Amazon, or your local bookstore. 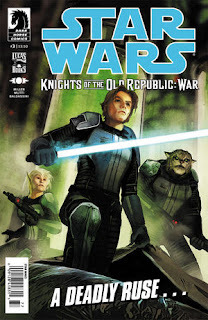 Kerra Holt ventures near the dark side on an incredibly important -- and personal -- mission in Star Wars: Knight Errant - Escape, launching this June. And IO9 has the first exclusive details about the series! This is easily the best — and darkest — Knight Errant arc yet, and it gives us the long-awaited showdown with Lord Odion — but it's not quite as anyone might have imagined, as Kerra ventures into the hopeless realm of the Odionate on a surprising mission. There are surprises aplenty, answers to mysteries, action — Escape has them in spades. 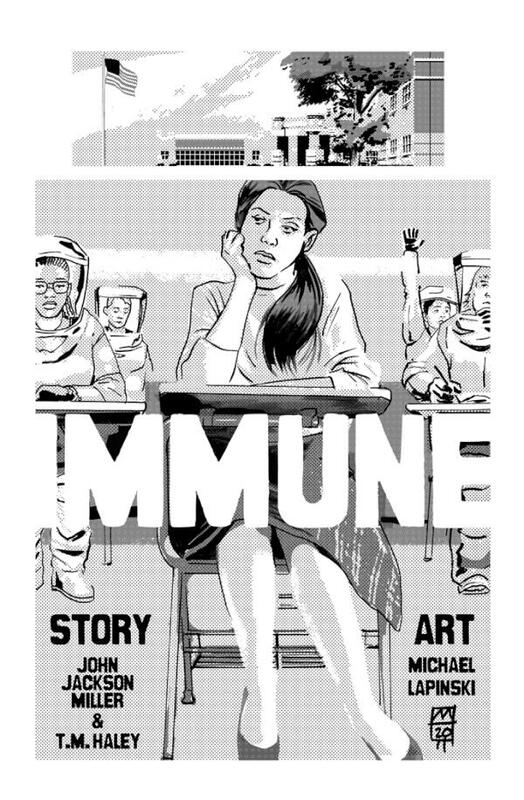 Click through to see the interview and the two variant covers. I hope to have the notes for Lost Tribe of the Sith #8 online here in a few days. Star Wars: Lost Tribe of the Sith #8: Secrets now available! And it's out! Star Wars: Lost Tribe of the Sith #8: Secrets can now be downloaded from Amazon. The Amazon link is here and Random House has links to other formats here, but I caution that historically these do not all go up for download at the same time, so please check again if something isn't out yet. Update: The Random House site has the direct-download PDF online now! As readers of the eighth story will find — there are many new horizons ahead for the Lost Tribe, and we'll see more in Pandemonium, the novella that forms a big chunk of this summer's Lost Tribe of the Sith: The Collected Stories print and digital release. The book can be gotten from Amazon for print or Kindle, as well as from other bookstores and services July 31; preorders available now. The book can also be ordered directly from Random House. Be sure to browse the site for their many other fine books! Also, there seems to be some sort of video game coming out tomorrow. Be sure to read up on your Mass Effect comics to get ready! 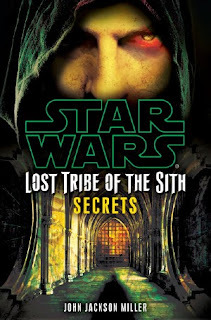 Monday, the eighth and final giveaway Lost Tribe of the Sith ebook, Secrets, becomes available from major outlets. The Amazon link is here and Random House has links to other formats here, but I caution that historically these do not all go up for download at the same time, so please check again if something isn't out yet. I do expect Random House will have the PDF out Monday and will add that link here when it's available. In the meantime — because it is way past time to do so — I have gotten online the notes for Purgatory, Sentinel, and Pantheon, also known as episodes 5-7. 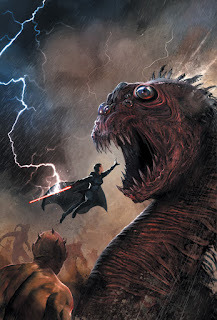 While I regret that it took this long (it's a testament to what my schedule has been like), proofreading for this July's Lost Tribe of the Sith: The Collected Stories book has given me a chance to reread it all, and so my impressions are all fresh even if my recollections aren't. And Pantheon's notes touch on the fun of writing a senior citizen who's on the periphery of the Sith power game, while also getting into the secret behind the alternating letters for our story titles. I was saddened to read of the passing of Ralph McQuarrie this evening. There are many remembrances on Facebook and Twitter, as there should be; his artwork helped make Star Wars into what we know and love. I prized my copies of The Art of Star Wars and The Art of The Empire Strikes Back as a kid — they were my first real chance to see a lot of his concept drawings and paintings. I remember getting the Ballantine portfolio of his art for The Empire Strikes Back — and while I had plastered my room with just about every other Star Wars related piece of artwork (ruining with thumbtacks some posters that are very expensive today), I always kept the prints pristine. I'm glad that we were able to do a little nod to his Vader/Starkiller painting with the cover to Star Wars: Knight Errant - Aflame #3; it's my favorite cover of the series, in large measure because of what it's in tribute to. 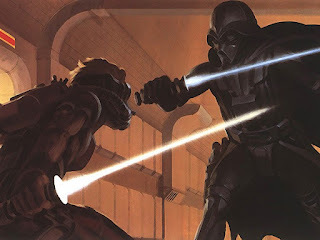 We owe a lot to Ralph McQuarrie, and he will definitely be missed. Some more updates to the site hopefully coming tomorrow; I hope to get the notes for the remaining Lost Tribe of the Sith chapters online, in advance of the release of "Secrets" on Monday.